Winner of the EE Rising Star award Letitia Wright poses in the press room during the EE British Academy Film Awards on Feb. 10, 2019, in London. While everyone in the music business took over Hollywood this past weekend, the silver screen squad descended upon London for the 2019 EE British Academy Film Awards. We usually refer to them (and their television counterpart) as the BAFTAs, as the awards are presented by the British Academy of Film and Television Arts. The television portion will take place on May 12, by the way. The most exciting award of the night, which is open to public voting by U.K. residents, was the EE Rising Star Award. 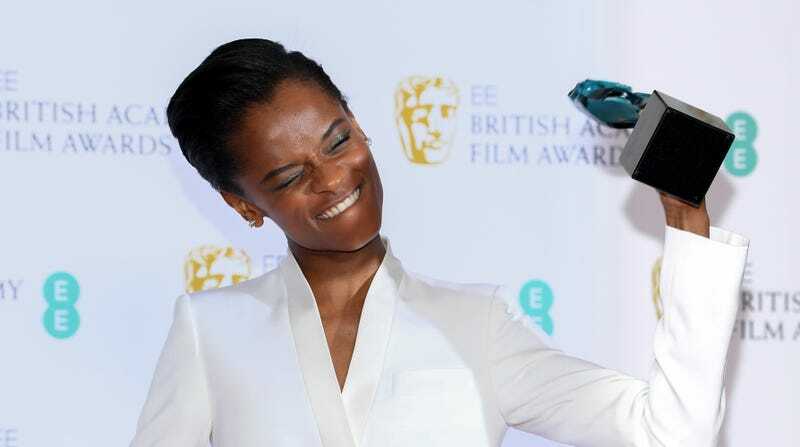 It went to none other than Letitia Wright! Called it! One could argue she’s already a star in many people’s eyes, given her breakout success with the biggest movie of 2018, Black Panther—but po-tay-to, po-tah-to! One thing’s for sure: Witnessing Wright’s momentum, the 25-year-old young wonder hasn’t even reached her pinnacle yet—hence the rising factor. Black Panther itself was actually only nominated for one award, which it won—Special Visual Effects. Mahershala Ali snagged the Supporting Actor award for Green Book, fully cementing his frontrunner status for the Oscar. This is looking to be a sweep for Ali in major film award ceremonies. He’s already won the Golden Globe and SAG Award in the same category so far. Speaking of sweeps, Spider-Man: Into the Spider-Verse copped that Animated Film win. It’ll be a legit upset if Spider-Verse and Ali don’t win their respective Oscars. BlacKkKlansman scored the Adapted Screenplay award, so congrats to Spike Lee, David Rabinowitz, Charlie Wachtel, and Kevin Willmott! For the complete list of BAFTA Award winners, head to BAFTA’s official website.